As a producer of industrial packaging, Schütz is certifying its production plants around the world to the Food Safety System Certification standard FSSC 22000. The newly created Schütz premium Foodcert standard ensures the comprehensive food safety of Schütz IBCs and PE drums far beyond legal requirements. The moment the subject of food safety comes up in connection with industrial packaging made of plastic, the focus of the conversation usually turns automatically to the packaging material. One reason for this is international legislation clearly states which material properties are permissible and those substances which are not, requires stringent product testing and sets limits, eg, maximum permissible migration. The fact of the matter today, however, is that maintaining a purely material focus largely ignores the needs of the market and absolutely fails to satisfy the current demands of the food industry. The guidelines of the US Food and Drug Administration (FDA) and its European counterparts restrict themselves to minimum requirements. The newly defined Schütz Foodcert standard, on the other hand, more than fulfils the needs of the food industry. With it, Schütz guarantees not just material safety, but full product and process safety throughout the supply chain, too. Schütz Foodcert IBCs and drums comply not only with the provisions of international food law but also include additional risk-minimising features, are produced just-in-time to customer specification and offer fully traceability. To ensure worldwide application of the Foodcert standard, Schütz is successively obtaining certification of all of its production plants to the latest industrial standard, FSSC 22000 (Food Safety System Certification, based on ISO 22000 and PAS 223), which has already been granted to the plants in Selters (Germany), Killala (Ireland), Montlingen (Switzerland), Moerdijk (Netherlands), Marcoussis (France), Doraville (USA)‚ Guarulhos (Brazil), Shanghai (China), Tianjin (China) and Nilai (Malaysia). The necessary preparations are in progress at other plants, which will soon also hold the certification. The FSSC 22000 standard is recognised by the GFSI (Global Food Safety Initiative), an international collaboration of leading food producers and retailers. The main objectives of the initiative are to ensure consumer safety and cooperation within the production chain. Since industrial packaging is normally used at the start of the food chain – for instance, for concentrates, intermediate products and raw materials – even the slightest impairment can trigger an enormous multiplier effect. Hence the particular need for risk minimisation! Maximum safety requirements call for extensive prevention programmes. That’s why Schütz has implemented a number of HACCP concepts (hazardous analysis and critical control points) in accordance with PAS 223 (Publicly Available Standard) and ISO 22000 (International Organization for Standardization). These standards apply to the buildings, plant and machinery, in fact, the entire production environment, and include detailed hygiene regulations for employees and cleaning rotas for workplaces. They also stipulate measures to avoid contamination with foreign bodies or dust, protection when handling waste, as well as glass and blade management. Machinery maintenance regulations and inspections, systematic pest control throughout the entire production site, instructions for the controlled use of all materials, especially chemicals, and strict control of incoming goods complete the package. All Schütz Foodcert packaging products are produced exclusively to individual customer order. 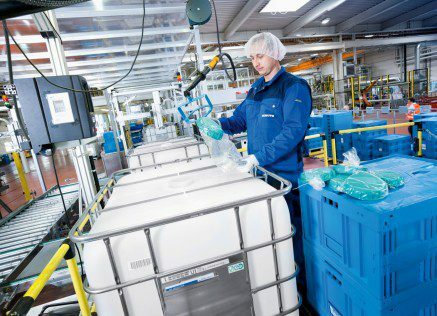 This general practice of just-in-time production helps to prevent opportunities for contamination from even arising because, as in the case of blow-moulded IBC inner bottles, they are taken straight to final assembly immediately after production. An additional advantage is that each step in the production process and every component can be clearly associated with the corresponding packaging. The barcode system of identification additionally permits seamless traceability – all the way back to batch and process level! Yet another great feature is that, on request, the packaging expert will also assign individual identification numbers to articles and packaging. The finished packaging is then immediately loaded and shipped without first being stored. But if shipping is not yet required, that’s not a problem either; in the interim, the containers and drums will be stored indoors. As a further option, plastic covers provide additional protection. Preproduced components, such as screw caps, outlet valves and bung plugs are hygienically packed and stored separately. US Food and Drug Administration and the EU. And when it comes to material, the same principle applies to all packaging – meeting FDA or Foodcert criteria – produced by the long-established Westerwald company: all IBC inner bottles, valve fittings, screw caps, drum bodies, lids and bung plugs are produced exclusively from new, single-grade HDPE. The raw materials used are food-safe, as are all dyes and gaskets. Components that come into contact with the filling product are checked to ensure conformity with migration limits. Silicones and other lubricants are purposely not used in the production process. In addition to its tried and trusted FDA models, Schütz now offers its customers a new premium series of packaging solutions that come with full material, product and process safety documentation in line with the far more stringent requirements of today’s food industry. Industrial customers choosing Foodcert can rest assured in the knowledge that they are ideally prepared to meet the future needs of the food industry. What’s more, by using Foodcert packaging, they comply with the wishes of their own customers, the end consumers, as a survey Infratest-dimap conducted for the German Ministry of Agriculture in January 2013 confirms: it found that two thirds (65 percent) of Germans have been taking a greater personal interest in food and how it is produced over the past few years.